The warm and loving memoirs of an animal doctor during the 30s and 40s, All Creatures Great and Small is a surprising package of comedy, warmth, sympathy, growing up, career woes and successes, love, and most importantly of all: the joy of new life and the companionable spirit of animals. James starts the memoir with his exit from vet school, full of hopes in a bad economy and the idealisms and terrors of youth. His first interview with the eccentric Dales vet Siegfried Farnon provides a job, a home, and a host of spastic but lovable friends, including Tristian Farnon, a vet-to-be who spends more time partying that studying. 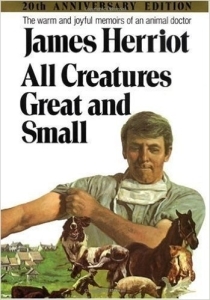 Filling his growing pangs as a vet and a man with stories of colloquial characters, Herriot captures the human spirit in an open, warm manner, bringing the people from his life fully alive and giving readers plenty of laughs and tears along the way. In a harsh world of violence and stress, Herriot’s laid back love of life, appreciation of nature, and pure gentleness are a rare treat. Told in a reflective manner, Herriot populates the solutions and salvations of animals and his profession against all of the things which they didn’t know – all of the tonics and potions they used that were actually pointless. This shows a growth and a nostalgia, but no bitterness, just an ever expanding sense of wonder at the unspooling of time. Devoted to animals, each chapter almost functions as a standalone story (with the exception of James’ courtship of Helen) giving the farmers and people just as much space as the beloved animals. Herriot shows true bonding, true love, and true humanity telling of experiences in such a way that non-medical and non-vet readers are still engaged, brutally tense, and passionately involved. As someone who didn’t live in the 30s or in the windswept, gaunt beauty of the Dales, Herriot made me feel there and alive in a way that is indefinable but utterly transmutable. Time melts away as he tells his stories and we trudge with him through freezing barns at late hours for a calving or, even more difficult, on a disastrous date. Something about his verve is just addictive and intensely personal – his words written in a chatty, over the coffee cups manner, bringing back all the daily desires of a life he loved and a profession he found compelling and ultimately fulfilling. The animals are no less present than the vivid people who walk these halls and these farmyards. From Clancy’s terrifying wolfhound with the ’womiting’ issue to Mrs. Pomphrey’s prized Pekinese, each personality shines warmly, each fluffy animal companion a central compatriot in the quiet, beautiful drama that is life. And there’s courtship too – one of the most hilarious segments of the book as a young Herriot tries to woo his favorite girl but ends up falling into all sorts of bad luck. It’s amusing and fun, full of an inherent truth and deeply intimate, and it highlights a rarely felt sense of community between the readers and the author who shares his life so openly. Poignant in a rare, beatific way, All Creatures Great and Small is a book not soon to be forgotten. On those cold days when life and work seems bleak, Herriot shows us the majesty of a content spirit and a man who can see humor and happiness in all things. Highly recommended.